I absolutely love the Olympics! I get sucked into the stories about the athletes, the competition, and the dramatic flair. The combination of pure athletic talent, competitive spirit, and constant devotion to training is impressive! And let’s not forget some of the winter sports like downhill skiing and ski jumping which are so foreign to this Florida girl…my adrenaline gets pumping and I’m just watching on TV! When I visited the Olympic stadium in Oslo, Norway I stood at the top of the ski jump and looked down an incredibly crazy-long ramp. That was over 15 years ago and I still feel anxious when I think of that moment! 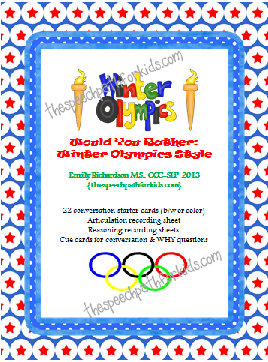 I am looking forward to sharing my excitement for the Olympics with my students this year. Unlike the Summer Olympics, these games will occur while school is in session so we will have a lot of real-time current events to discuss. We have been working hard on predictions within the contexts of various stories, New Year’s resolutions, therapy games, and our weekly bar graph questions. Now we will have three weeks of Olympic events and medal ceremonies to predict, count, and analyze! #1) First up, a continuation in my series of “Would you rather” questions. These have quickly become a favorite for my students. They enjoy the chance to imagine possibilities. It has opened up opportunities for conversation too. Using my Would You Rather: Thanksgiving unit, one of my (extremely reserved) 4th graders was answering a question about if he’d rather eat Thanksgiving dinner with someone famous or his family. He chose Cam Newton, the quarterback on our hometown football team, the Carolina Panthers. His answer got us talking about who, why, and what questions we’d ask. Well, it turns out that he had met Cam the day before with an after school program. He never would have initiated sharing that because it would draw too much attention to him. However, we were able to learn so much about his thoughts, feelings, and experiences through that one question. It was such an unexpected moment and one of the many reasons I love using “Would You Rather” questions in therapy! I have b/w and color versions of the cards to match your printing needs 🙂 You can find this set in both my TPT and TN stores. Also, be sure to check out the other Would You Rather question sets (click on the links below – two are freebies!). 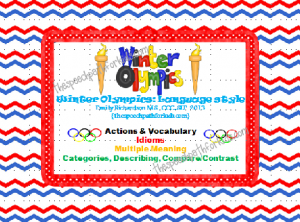 #2) For a more comprehensive approach to targeting language skills, I am using this “Winter Olympics: Language Style” packet. 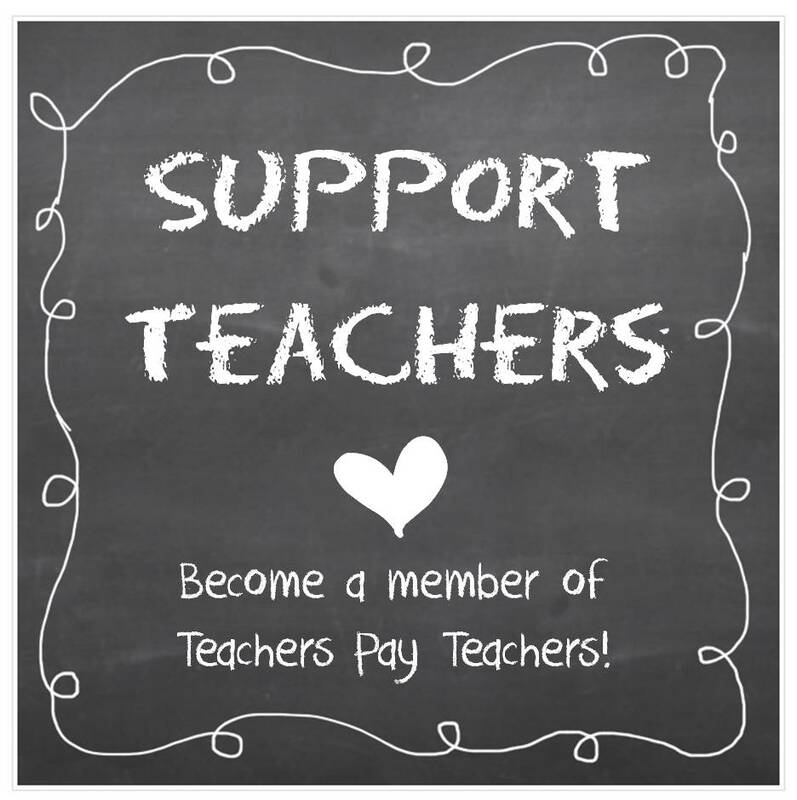 You can find this packet in my TPT and TN stores. #3) Still looking for more Winter Olympics activities? Check out this set which follows the same format as my other “Follow the Clues” packets. 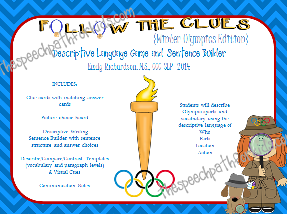 Using this set of materials, students will follow clues to describe Olympic sports and vocabulary using the descriptive language of who, parts, location, and action. Visual structure is provided throughout the activities. These activities promote descriptive language skills, social interaction with questioning and answers between peers, and expanding sentence structure. It works bottom up to provide the detailed clues and the student generates the answer, as well as top down where the item is given and the student describes it with details. My students have really responded to this format for listening and answering, so I’m excited to use the Olympic content with them. I added a new dimension to this set which I am super pumped about! There is a template to describe, compare, and contrast using the descriptive language being practiced. Using the word level template, students can choose two of the vocabulary words or sports. They describe by the features reviewed in the earlier cards, then use the Venn diagram to compare/contrast. 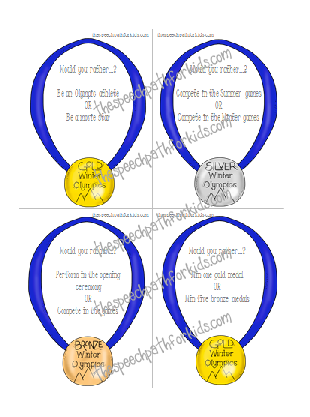 For students working at the story level, they read (or listen to) paragraphs with information about the Winter and Summer Olympics. 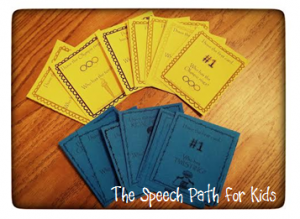 Each page has visual cues for comprehension and retell support. They then follow the same format to describe, compare, ad contrast (An answer key is provided). This provides more opportunities to differentiate within and across sessions, as well as having good materials for home carryover. You can also find this packet in my TPT and TN stores. Whew!!! I hope this gives you some good resources! 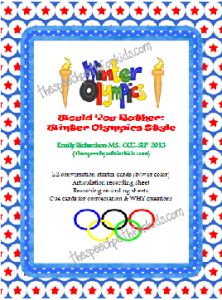 I’d love to hear how you are incorporating the Winter Olympics into your therapy sessions.